Createspace Independent Publishing Platform, 9781535358477, 108pp. Calm Breezes, A Serenity Coloring Book can brighten your day and help stress melt away. Belinda's artist drawings and lovely quotes make a wonderful adult coloring book. 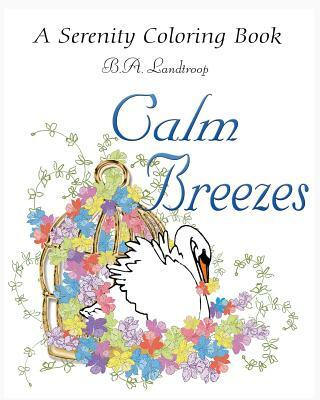 Calm Breezes, A Serenity Coloring Book is a wonderful way to color tension and worries away making beautiful art, in your own unique coloring style. Where I grew up the mountains, caves, creeks and wildlife colored my writing with southern flavor, brought me the serenity of nature and the adventure of life, while dazzling me with colors I never imagined. Like most children I colored as soon as I could hold a crayon. Now I do it as a grow up with colored pencils, pen & ink and hope to never stop coloring my world. When I'm not working on a book time is enjoyed with my family, going to the mountains, painting, taking photos or curled up with a cup of tea and a book. B.A. Landtroop is an award winning artist in watercolor, acrylic, pen & ink and mixed media. Her books are sold throughout the world. You can learn more about her books, art and printable projects online at www.belindalandtroop.com Life! You never know what might happen or when.